We Have Some Amazing Trees Around Us. GO AND SEE FOR YOURSELF! There is no better therapy than taking time out of our busy lives to stop and sit under the shade of an amazing tree. 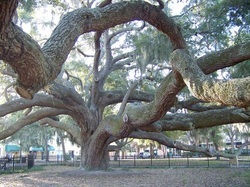 Here in the Tampa Bay Area we have some very remarkable trees that provide lots of therapy for the busy minded. On any given day, you might be able to find us under one of our favorite trees enjoying the peace and tranquility that they provide. This is the Baranoff Oak Tree, in Downtown Safety Harbor. It's magnificent branches seem to have no end as they twist and turn their way to the sky. Click here to find out where to go to see this tree. to find out where to go to see this tree. 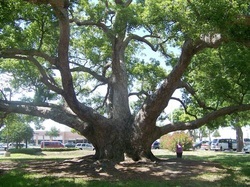 The Champion Camphor Tree located near the intersection of Gulf to Bay Blvd. and US 19 is one of the largest of it's kind in the State of Florida. One of it's most impressive features is the width of it's massive trunk. It would take approximately 4 full grown adults standing hand to hand to wrap around it. Believe it or not, this tree is fairly young compared to others it's size. Local zoning records put this tree right around 90 years old. Click Here to find out where to go to find this tree.